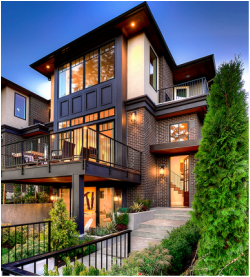 These homes bring an air of Park Avenue sophistication to Northwest urban living and a unique offering with a stately presence; where handsome, architectural detailing and great attention to aesthetic integrity are obvious inside and out. Featuring an open great room plan with entertainment deck and epicurean kitchens that are as glamorous as they are functional. Luxurious master suites feature a fabulous floor-to-ceiling stone fireplace, private terrace and beautiful spa bath. There’s also a main floor office area, plus a substantial upstairs loft area for potential office or study. On the lower level, enjoy the large bonus/recreation room with wet bar and access to a covered outdoor patio; as well as a guest suite, making it perfect for extended guests. Within walking distance of the synergy of Downtown Kirkland's waterfront parks, restaurants and boutiques.